Search Engine Optimization (SEO) is regarded as a difficult and uncertain concept but it really isn’t. We break down the key elements of an effective SEO strategy to focus on in 2019. If you try to Google the factors that affect how your website ranks, you will end up on the 20th page and still feel like there’s more. Truthfully, there is a myriad of information out there on SEO strategies, with many suggesting over 100 different factors. While it is true that there are several variables that work together to determine how your website ranks, many things you’ll find on the internet are more or less blind guesses. In fact, many of the factors you will see are not just that important. Take a deep breath and be calm. 2019 will be the year that you finally get a grasp of what you need to do to get results on your digital marketing campaigns. Do you know why? Because you will read this article, digest it, and act on it. SEO is actually very simple when you understand it and this article provides the breakdown you need. What are the Important Areas of SEO to Focus on in 2019? Broadly speaking (or writing), as a site owner, there are just four aspects of SEO you need to be concerned about. The Technical Aspect of Your SEO Strategy. 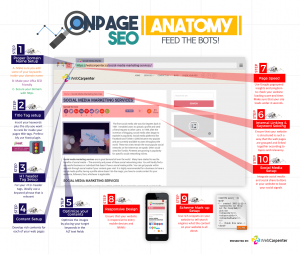 This entails how well the content you have on your website can be crawled and indexed. Your On-Site SEO. This involves optimization of both the HTML and the actual content. Your Off-Site SEO. Here we discuss how you can become an authority in your niche as this is how Google will work in your favor. People instantly get scared when they hear the word, “technical”, especially when they feel they don’t have enough skill. But really, this aspect is majorly centered around the content management system you employ. Because it’s the tool you use that will determine how different search engines read your content and crawl your website. If you have no experience with this, you should consider using tools like Screaming Frog and Deep Crawl. These are well suited for exploring and then highlighting the technical problems with your website. In essence, what are the factors to consider here? Crawling — Will search engines be able to explore your site? Indexing — Are the pages to be indexed clearly outlined for the search engine? Mobile — Friendly Page- A significant portion of global traffic is being generated on the mobile phone, does your website fit the bill? Speed — How fast does your page load? This can make or mar your SEO aspirations in 2019. Hierarchy — What is the structure of content on your website? You will observe that this part of your SEO hugely depends on how the website is developed, so hiring a skilled website designer will go a long way in helping you actualize your dreams in 2019. Excellent User Experience — In 2018, Google allowed mediocre UX, but this will not be condoned in 2019. Meta Descriptions — Come up with meta descriptions that are just like ad copies and they will drive traffic to you. Although, Google engineers say meta description is not a ranking factor. My advice? Do not believe everything Google says. They will never reveal their secrets to you. Page Titles — With adequate keyword research, you should know what each page title should entail. You want to make sure, your keywords are scattered around your titles strategically. Be careful not to over optimize your titles – which could get your penalized by Google. Content Optimization — You should include the keyword with a sensible density and variation while answering the questions your audience have. Building authority is just as important as any other SEO strategy we have outlined and you ought to pay attention each one of them. One of the main strategies of building authority is link building. Even though we said SEO is easy once you get a grasp of it, links are quite difficult to get a hold of. This is the tedious part of SEO. However, one simple philosophy to adhere to with link building is; “Connect what should be connected.” Simple, right? Having this in mind will help you avoid the “more, more, more” notion. Scaling the link-building strategy entails more of creating content that is worthy of backlinks. The idea is to write articles that will make similar websites to link to. Just think of how websites like Wikipedia, Forbes, and the rest have millions of links, even without actively seeking it out. This should be your motivation in 2019. Your service content covers the specifics of what you do, how you go about it, the benefits, and how it can help the public. Credibility content, on the other hand, is essentially giving a potential client reasons to ditch other service providers and stick with you. The marketing content is what enthrones you as an expert in the field and places you in pole position to land new clients. You now realize that SEO isn’t so hard now, is it? And, ideally, you can leverage these steps and attempt to break forth in the new year. But why not entrust your business into the hands of a professional who has worked on building links, creating content, and helping businesses grow? We’ve been providing SEO services for donkey years now and there’s no doubt that we are the right choice for your business in 2019. Contact us now to see how we can be of help to you.